Egyptian President Abdel-Fattah El-Sisi has commissioned Minister of Irrigation Mohamed Abdel-Aty to attend the inauguration of Congo’s new president-elect, Felix Tshisekedi, Thursday. El-Sisi congratulated Tshisekedi in a letter he sent Monday, a day after a Congo court upheld the results of the country’s disputed election. El-Sisi is one of a number of African leaders who sent congratulations to the new Congolese leader Sunday and Monday, a sign that the controversial vote will not be questioned internationally. The Egyptian president hailed Tshisekedi for “the confidence given to him by the people of the Democratic Republic of Congo, which demonstrates their belief in his leadership abilities and vision to achieve stability, development and prosperity in the country,” Egyptian presidency spokesman Bassam Rady said in a statement. El-Sisi underlined that he is looking forward to continuing to boost bilateral ties between Egypt and Congo under Tshisekedi, adding that he hopes to meet "at the earliest opportunity," the statement said. A statement by Egypt’s irrigation ministry affirmed that Egypt’s participation the inauguration affirms Cairo’s keeness on achieving the mutual interests and aspirations of the people of both brotherly countries. 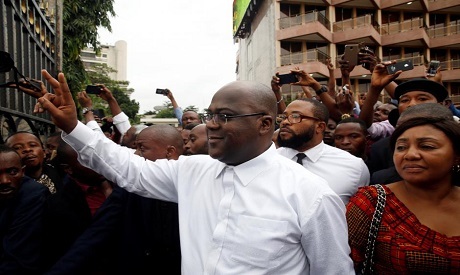 Congo’s Constitutional Court confirmed the win of Tshisekedi Sunday, rejecting claims of fraud and a request by runner-up Martin Fayulu for a recount of the 30 December vote. The court's announcement came after the African Union asked for the final results to be postponed, citing “serious doubts” about the vote, which raised fears that the crisis could trigger unrest in the the Central African nation.